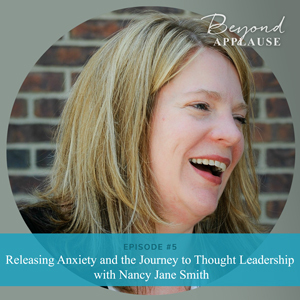 This week, I am so excited to bring to you my conversation with a brilliant speaker and thought leader Nancy Jane Smith. 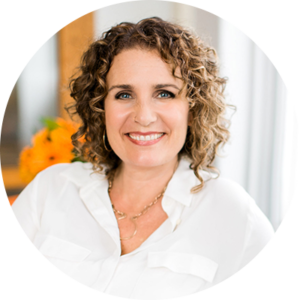 Nancy Jane is a licensed professional counselor, speaker, author and trainer with over 20 years of experience helping individuals and organizations quiet their inner monger so they can be more productive and less overwhelmed. She hosts a bi-weekly podcast, Happiness Hacks, and recently published her third book, The Happier Approach: Be Kind to Yourself, Feel Happier and Still Accomplish Your Goals. This episode is a double-hitter. In this value-packed interview, I’m talking to Nancy Jane about two powerful topics. One is Nancy Jane’s inspirational story of her path to thought leadership as she got clear on her message over years and started speaking on exciting stages that really matter to her. In the second part of this honest and fun conversation, we also talk about the core of Nancy Jane’s Rooftop Message – releasing anxiety. Join us as Nancy Jane shares very accessible in-the-moment useful tips that you can apply to your speaking and thought leadership journey. Make sure to download the Get Started Speaking Guide that I created just for you to help you get started on the path of speaking and thought leadership! Nancy Jane’s Rooftop Message and how she was able to zero in on and artfully craft it. The lightbulb moment that helped her figure out exactly how she was going to take a stand. Why you shouldn’t wait to perfect your message before you go out and share it with the world. How Nancy Jane shares her message and how it served her business goals. How she began finding and landing speaking gigs on the path of thought leadership. Two main concepts from Nancy Jane’s book that will help you accomplish your goals and feel happier. Tips and strategies for releasing anxiety to help you with your speaking. You are listening to the Beyond Applause podcast episode number five. Michelle: Hello, my speaker friends. This episode is a double hitter. It’s longer than usual because it’s essentially two podcasts in one. I had this great conversation with my friend, Nancy Jane Smith, for this podcast. And within it, really, we touch on two powerful elements that I’m excited to bring to you. One is, her own inspirational story on her path to thought leadership as she has gotten clear on her message over the years. So clear that she could write a book on it and start speaking on better and more exciting stages. And stages that really matter to her. So that whole thought leadership piece. And then, we also talk about how to release anxiety because that is at the core of Nancy Jane’s rooftop message. That’s what her book is about. So really, the first half of this episode we talk all about her own path to thought leadership and getting on these stages that she now gets to speak on writing her book, that kind of thing. And then in the second half, she shares these very accessible, in the moment, useful tips that you can apply to your own speaking and thought leadership journey. I loved this honest and fun conversation with Nancy Jane and I hope you do too. For this week, I’m going to let Nancy Jane’s own thought leadership journey story take the place of our usual story of inspiration because it fits the bill perfectly. I have heard from a number of our podcast listeners that interviews are inspiring and helpful. And I think this one will definitely fit right into that same vein. So here we go, I’m excited. Let’s dive in. Welcome, my speaker friends. I am the luckiest person in all the land because I get to have these conversations with brilliant speakers and thought leaders, like Nancy Jane Smith. Even better, we get to have this conversation with you right alongside us. I’m so happy you’re here. 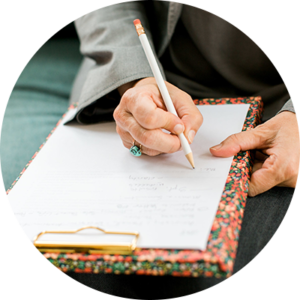 Nancy Jane Smith is a licensed professional counselor, speaker, author, and trainer with over 20 years of experience helping individuals and organizations quiet their inner monger so they can be more productive and less overwhelmed. She hosts a bi-weekly podcast called Happiness Hacks. And recently published her third book, The Happier Approach: Be Kind to Yourself, Feel Happier, and Still Accomplish Your Goals. Which is a book that I absolutely love myself. So we’re going to talk more about that. Nancy is also one of my dearest friends, and I’m so excited to have her with us today as both inspiration, as someone who courageously climbs onto the rooftop with her own message, as well as a super practical resource for dealing with a speaking anxiety. That is such a normal part of great speaking and thought leadership overall. Welcome Nancy, I’m so excited to dive in with you on these topics and wherever else our conversation naturally takes us. Nancy: I’m excited to be here. Thank you so much for having me. Michelle: So imagine, you are in this little town. And the streets in this town are full of people who are struggling. And they’re talking to each other, there’s chaos everywhere they’re saying, “What are we going to do? How are we going to fix this? This is awful.” And you’re standing among them. And you’re listening, and you’re thinking I can help them. I can help you. And you want to tell them all, “Wait, let me help,” but they can’t hear you because they’re all talking and there’s chaos everywhere. And so you look off to the right and you see that there’s this building and there’s a ladder up against the building. And the rooftop on this building is relatively flat. So you walk over to this ladder, you climb up to that rooftop. You cup your hands around your mouth and you shout, “Listen to me, beautiful people. Here’s what you need to know to make your lives better.” Two things. What would you say to those people? And then also, a little bit about who was on those streets? Who was on the streets that you are meant to serve? Nancy: Okay, well first off, I just love that analogy because it’s just so … or is it a metaphor? I don’t know, but it’s so visually wonderful. And the answer is the people on the streets, so I’ll answer question two first, are individuals who are struggling with anxiety. And a general anxiety of overwork, overwhelmed, the to-do list that’s so long. They’re looking externally for approval, and they’re constantly pushing for that ideal self. They’re constantly trying to be better. And they have tried to do the meditations and all the stuff we teach in wellness. They’ve tried to eat right and drink their water and get enough sleep. Either that falls off the wagon, and they don’t continue with it or it just doesn’t work. I am on the top of the rooftop screaming that it is about we need to be dealing with the thoughts in our heads and how we talk to ourselves. Nancy: That is building a loyalty to ourselves is what is going to stop this anxiety. If we can build a loyalty to ourselves, we can stop looking externally for all of the answers and striving for that ideal self. And we’ll value these wellness exercises that do work in decreasing anxiety, we just don’t implement them. So it’s not that they don’t work necessarily it’s that we don’t take the time to do them because we’re so busy with our to-do lists and figuring everything else out. Michelle: So with loyalty to ourselves is that when you talk about this because of the faults in our head or whatever. It’s those thoughts are disloyal? Nancy: I’ve been working on this message, obviously as we all do, as entrepreneurs, trying to get crystal clear on what is it we’re talking about and what’s the message I’m going to scream from the rooftops. And so for years I just did anxiety. I just worked with people with anxiety, and it was really vague in general. And practiced all the things I just talked about. Telling people to meditate and do all these good things for themselves. And I wasn’t practicing them, my clients weren’t practicing them, none of us were doing it. And I was like well this isn’t working then if none of us are implementing any of this stuff. So I started looking at it at a different perspective. So I realized it’s how we’re talking to ourselves that keeps us stuck. So that was kind of part one of my work is really looking at that inner critic and how we’re talking to ourselves. After working with that for a while the message just keeps, I keep wanting to say expanding but also fine-tuning. And at the same time, it’s a depth is a better way of saying it. And the depth of that message, I realized, was the reason the inner critic, I call it a monger, because a monger is something that spreads propaganda. Nancy: And the reason that our monger has so much power is because it’s telling us things to keep us safe. And so, to keep us from being too vulnerable, too out there, too exposed. I wouldn’t say that the voice is keeping us is disloyal, but the voice is giving us information from the external world. And I want us to start being loyal to ourselves, and not loyal to what people are doing on Facebook or what our competitors are doing or what our parents told us we should do or all these rules that our inner critic sets up for us. I want us to be coming from internally what do I want? What are my values, what are my priorities, what’s important to me? Michelle: And so, when we cultivate this kind of internal loyalty, if I’m understanding you correctly, then we’re more likely to consistently act on some of these other practices that really do help. Like meditation, or I can’t remember the first examples that you gave, but many of these practices that help us take care of ourselves and feel more peaceful in or lives. And then ultimately be more productive? Nancy: Yes. Absolutely, that is what I believe. Because I believe a lot of people when they’re dealing with anxiety and stress. The number one thing people say to me is I just want to feel content. I just want to stop spinning. And so that idea I think is if when we can trust ourselves and come back to this is what’s most important to me right now, even though we’re being pulled in five different directions. I can come back to what’s most important to me. Michelle: Yeah, okay. And I know we’re going to dive … I’m sort of feeling this pull to kind of dive into your whole ask process. All these things because I’m like oh I want my audience to know how practical this can actually be. But before we go there I want to just stay in the realm of your message and who you serve. Because I know that a lot of people listening some of their struggles or … the reason that I wanted to talk with you is because you’re sort of like a twofold help in this domain. Michelle: Number one, you’re like a story of inspiration. You’re out there, taking a stand for this message. This message that we can cultivate an internal loyalty to ourselves, such that we can act on the things in our lives that make us feel less anxiety. So you are out there sharing this message as a thought leader, as a speaker and writing books and that kind of thing. Then also, of course because the people listening to this podcast are speakers and thought leaders. There’s the natural anxiety that goes with that. I’m holding off, I’m diving in on the actual process because I want to make sure we apply it to that part of speaking and thought leadership. Before we go there, I just want to hear and ask you to share about how did you land on this message? One of the things that a lot of people that I work with and talk with who want to take a stand for their message, struggle with. Surprisingly, they often know kind of the general content. Sort of like you talked about. They’re like, “Oh I know it has to do with anxiety. I know my people are struggling with this thing in general.” But it’s hard to get it down to like a specific message. Your message of kind of cultivating that internal loyalty so that you can go do the things that allow you to feel calmer, less anxious. How did you land on your specific message? And also, I want to know why it matters so much to you? And maybe the two will kind of weave together. Nancy: Yeah, it took years. Not to be a downer for your audience. Michelle: No, I know. For me too. For most of us so there it is. Nancy: I would say that I think it does take years because you’re constantly, you know, I would be speaking and now this stuff I would speak on … now I would never speak on the stuff I was speaking on at the very beginning about anxiety. Which was the basics of drink your water and get enough sleep and all that general wellness information. So it took years of working with clients and doing speaking gigs and hearing the feedback from people. When I would do those general wellness speaking, their eyes would glaze over and it would be they’ve heard this a million times. This is not new information. And so, it was boring for me, it was boring for them. Nancy: And I was like, ding. And it was just like a huge light bulb went off because I felt the same way. She was speaking the truth of it isn’t that we don’t know what to do it’s that we don’t want to do it, because our inner critic is telling us, or our monger is telling us don’t do that. That’s when I really started flushing it out and that was years ago. I think it was four or five years ago she said that to me. And I ignored her. It took a while until it popped back into my head like wait a minute. And I would do all this monger work with clients and it wasn’t working. That was partly how I started on the message. And then the big influence, I guess, and the big I have to take a stand on this moment came when I was talking with my dad who had Parkinson’s with dementia. Realizing, he still felt like a failure. After 70, he died at 78 and had all these successes. Everyone really thought the world of him and he could … the first thing he would let me off to me were his failures. And so that I was just like this can’t keep happening. We can’t keep living like this. And I can’t keep living like this. My clients can’t keep … this is my stand. And it seemed like a passion project to really talk about this and figure out a way around it. Michelle: I love that. And I even love that you are both willing to and I know we’re both laughing as we say oh it took years. And I would never speak on those things that I spoke about in the beginning. And yet, this is the thing that we have to start. We have to start wherever we are. And all along the way people were served, including your friend that day learned what she wasn’t willing to do. Michelle: And there were people in that audience who still needed to hear about sleep and drinking water, whatever. Like that was something that was going to serve them on their path. Obviously, there was a better message to be uncovered over time. But one of the things I think that I know I tended to do and still can get caught up in is wanting to perfect the message. Or perfect what I’m putting out into the world before I put it out there. And it’s impossible. Right? Michelle: Nice, as a bonus. Be willing to come up to you and say that’s actually not working for me so that you could refine it. Had you never been out there sharing it, you couldn’t. Right? Nancy: Right. And I definitely think that message of drink your water and those wellness hacks was the perfect message for me at that time. And I needed to go through all those versions of that to get to this message. Michelle: Yeah. I talk a lot about story of transformation and often will point people to a moment in time. Something like you’re describing about your dad, although you didn’t specifically name a moment in time but you … a relationship just sort of like noticing this in your dad. Nancy: That story, I have cultivated that story. It’s become a bigger story to me. And as it’s become a bigger story I’ve built more passion around this topic. So it shows the power of that story in spurring me on to do this work. Michelle: Yeah. And I love that. I love all of what you just said together. I see things … I always see visuals for some reason. I’m seeing this almost like a timeline. Here’s you, speaking at some I’m guessing relatively small community venue. You got a bunch of friends in the audience as we always do at our first or in our early-ish and even in some of our later talks. And you’re doing what you got right then. And you’re learning something there. And then you go do the next one and that’s refined a little bit more. Maybe you tell the story about your friend coming up and saying that. Kind of like, I realize this isn’t the whole picture. But maybe you didn’t quite know what the whole picture was yet. Probably you don’t know any more than I do. Because we keep evolving with our message. We’re just where we are at any given point. And then something comes along that helps us really anchor into it. Like this realization you had around your dad and his life and what his monger has created in his experience. It just fuels this big thrust, it seems like. Nancy: Yeah, absolutely. Because the other thing that’s interesting is that I tried to get away from … I coined the term monger years ago and I tried to get away from it. But I kept having people, because I kept thinking oh it’s too much to introduce a new word with inner critic and gremlin already out there. Why am I introducing a new word? I kept having people repeat it back to me. My monger is saying this and my monger is saying that. And I was like, oh. It was like I couldn’t get away from it even if I wanted to. Nancy: That’s something to pay attention to. Where are those messages coming? Stuff that you think, “Oh I said this too many times and no one care anymore,” and they do. Michelle: Yes. And listening, that just shows how powerful it is to really listen to what your audience is feeding back to you. Michelle: I’m sure I’ve heard you say monger. I didn’t know I heard you say monger lots and lots of times. I’m not sure I’ve heard the definition or had it really register the way it did just in this conversation. Spreading propaganda, I love it. I can just kind of see and hear that monger in my head, with some kind of tabloid, newspaper in hand or something. Nancy: Yes. That’s a great visual. Michelle: That’s the one that came to me. So yeah, I love that and it did answer both the whole how did you land on this message through that evolution? And why does it matter so much to you that story about your dad? That is why it is so powerful to … even if we know we care deeply about a topic and we’re not struggling with passion around it. How powerful it is to articulate that story. Like you said, you’ve cultivated that story. To spend the time to say, “Okay why does this matter to me? Is there a story in here?” And then actually continually refining that story. Because it does provide such fuel. Michelle: Yeah, I love that. To talk to us about where you speak and just talk about speaking in general? How do you share this message? And how has it served your business goals? Michelle: Wow interesting. That’s a cool tip. Nancy: So yeah you never know where you’re going to get them. And so, a lot of times I’ll get a speaking gig and then I’ll get other speaking gigs from that’s how my … it tends to go word of mouth that way. But I started doing this leadership summit. I think I did like eight speaking gigs for them in a year. Like I did every committee and everywhere they could find me. They wanted me to do this leadership summit on criticism. And this is a hilarious story. I’m in the bathroom. We’re finishing up, I’m done, I’m headed home for the day. I’m in the bathroom with one of the managers of the non-profit and she’s speaking to me through the stall. Saying in a heavy British accent, which I’m not going to butcher. But that’s added to the hilarity of the story. “Nancy Jane you have to raise your fees. You have to. Now not for us, but for everybody else you have to raise your fees.” And so that’s when I really started, “Oh maybe there is something to this” I just really am appreciative to her for seeing that in me. Like I said, they had me come and speak on criticism. And the fascinating thing is, speaking of the National Organization for Women Business Owners, I’ve pitched to them multiple times to get to do one of their conferences, locally. And I never got in because I was always doing inner critic. And I would always couch it in inner critic. And then finally I was like, “Oh what if I used criticism and building resilience?” And bingo, bango I got it. Because that’s what the National Organization of Women Business Owners are thinking about. They’re not thinking about inner critic. And so that was a huge lesson to me to be like it’s the same topic. But it’s a different slice of that topic. To be reframing that it’s still my rooftop message, it’s just couched in a different way. It was a huge eye-opener to me. Michelle: There’s such irony in that. Nancy: Such irony in that. And I did it on my happier approach concept and they just loved it. So it was just like, oh this fits in a variety of places. So and that lesson took me a lot longer than I wish it would have. Even though I have a rooftop message, there’s a lot of slices of that. There’s a lot of trails that come off of that, that can fit a variety of areas. So that’s been a big a-ha for me when it came to my speaking. Michelle: So interesting, so there’s so much rich stuff that I want to just go a little bit further into. First of all, thank you for bringing up pitching. Because even just saying then I pitched NABO, National Association of Women Business Owners. One of the most common questions that I get asked, just was asked this again in the airport coming home from a trip yesterday. In a conversation with somebody and she was saying, I really loved … I was just speaking at this particular event. “I loved it, I’d love to do more of that.” You just don’t know where to start or how to do it. And it’s always interesting to me but of course this is how it works. When you’re already within an industry like you’re already speaking. Pitching is just something you say or do. You’re like, oh of course if I want to speak somewhere I go figure out how to submit a proposal. Right? Michelle: People don’t even know that is actually something that people who speak regularly do. A whole new world opens up when you realize you actually … and so there’s a part of me that always wants to say well it’s kind of simple. Do you know the kind of people you want to speak for? Well go look for their conferences and then look for the call for speakers. But if you don’t know that, you don’t know that. Right? Nancy: Right. And it almost seems too easy. It’s like it’s supposed to be this mystery and not that they’re just going to have. I just googled before we got on the phone, I googled conference speakers, Columbus Ohio and up came the Ohio Human Resources Association is having a call. And I was like, “Oh I need to get on these.” It is truly one of those things of you just have to do it. Like you just have to fill out the form. Michelle: … it’s not even the best way you get speaking gigs. It’s just if you’re wondering how to branch out. It is a part of spreading our message far and wide. Right? Michelle: Of course, the first question is do I know anyone at the National Association of Human Resources? Or whatever that organization you just said is. Of course, the first … because that is the best way. Because that decreases uncertainty for the meeting professionals. They’re like, “Oh you know them? Are they a good speaker?” All kinds of uncertainty gets released there. But if you don’t know anyone that’s the way to know. So even just bringing up pitching is so helpful. And what a good tip. Thank you for giving that example of just searching. Call for speakers, Columbus Ohio, I love it. Everyone listening, put in call for speakers whatever your local area is or where you’d like to go. Nancy: And the other thing about that it was a tough lesson for me was they’re doing a call for speakers for September 2019. Michelle: Yes they are. Yes, they do. Nancy: It’s a plan ahead thing. If that’s the way you want to go. It’s not like I can do it this year for some of them. Michelle: No, that’s absolutely true. In this time of year, you’re definitely looking at 2019, unless there’s some kind of strange anomaly. There are ones that maybe a speaker had to cancel or they’re just doing a spontaneous event. But yeah absolutely you’re about a year out. So that is a very good point to bring up too. And then the second thing that you said is this whole, I love this thank you for saying it, the whole you talk about inner critic, so you’re proposing about inner critic. In fact, when we do a really rich audience analysis and we get into their minds and hearts. What are they saying in their heads? They’re probably not saying inner critic. Inner critic is our term. Right? Michelle: From the inside. They’re saying in their world it sounds like more things like criticism and resilience. In that particular audience, those are the words that cue their interests. Even more than interest, that they’re trying to solve problems around. And so, when you talked about these, I can’t remember how you said it. You got your rooftop message and then you got kind of these slices of it. I think of it like and then it’s also good to think what other towns? What other towns, what other streets of people might also need this message? Right? Michelle: You start off with one, it’s kind of like I worked with women who are juggling lots of things and work in corporate America. I’m kind of making it up. But then getting even more niche like you just said. What if the streets are filled with lawyers? How would this message change? Not the core of it, just the words in it. Nancy: Yes, exactly that’s a great way of saying it yeah. Michelle: Awesome and so just sort of thinking about the speaking that you’re doing, and your thought leadership overall. What is it on behalf of? You said you love speaking. When you go out and speak what are you hoping to get from it? Nancy: That’s a good question. Much to the detriment of my bottom line, I am just really wanting to spread the message. That is the motivation and I’ve been trying to think more in that way of what is it you want to get from it. Because I think for my bottom line that’s a better way of thinking about it. But my motivation truly has been you want to hear about it, I want to tell you about it. And let me be a thought leader in this area. Michelle: So far it has been impact, reach, establishing thought leadership and kind of a platform. Right? Michelle: If I’m hearing you right. Yeah. And it’s been building from that domain. And if I’m hearing you right, although you didn’t say this exactly, you would also now like to be thinking about how can you use speaking to cultivate other aspects in your business that bring in more income. Maybe clients or future, bigger, paid speaking gigs. Nancy: Yes, yeah. Because slowly over time without me … not without me trying but without me super focusing on it. I have built a speaking platform. And I would like that to be a much bigger … like you said to be getting more money in that vein. And it’s because I haven’t been super focused on it, it hasn’t grown as quickly as I would have liked. But I think switching that focus and putting my energy specifically there. Now that I have the rooftop message is a good combo. Michelle: Yeah. And you got this book, which we are going to dive into now in just a moment and the content of the book. Because I think it does, you know, sometimes at least it’s been my experience too as I wrote my most recent. It is also, I guess technically my third book, although I don’t talk very much about my first two. Nancy: I don’t really either, but I hear you. Michelle: It’s not that they’re not useful. Sometimes I talk about my second one because it’s kind of a practical how to craft a talk guide. But once you crystallize like speaking and book writing can go together so well. I often, when I work with clients on a talk we craft their talk, and they’re like then you can see the book in there. Right? Michelle: When you write a book you often can see the talk in there. So I wondered did that happen for you? Even more. Nancy: It did. Because I crafted my talk, and I knew I wanted to talk about self-compassion and mongers. So I crafted my talk and then I decided I wanted to write the book. So I wrote the book, which was different than my talk. Then I had to go back and redo. It was just more in-depth on the talk. Had I not started crafting my talk, I wouldn’t have come up with the ideas for the book. Nancy: Because that’s one of my favorite things to say when I start. I didn’t talk about this, one of the things I’ve been doing with the book is little in-home book talks that are just living room, people have meetings in their house. And one of the things I’ll always say when I start it is please push back on me. If this isn’t resonating with you or you have an issue where you don’t understand something, please let me know. And it’s almost is if you can see the whole audience just go, huh. They just kind of take an exhale. And I think it’s because I’m like, “We’re in this together. And I’m trying to fine tune this and you’re going to help me do that through your ideas.” So it builds a really cool conversation because it disarms me that I need to be all on topic. And be super on top of this. There are going to be people that this isn’t going to resonate with. And so how do I deal with that? Michelle: Yeah. And also I’m thinking about my own process of sharing about my book. One of the things that I love about it is when you put those ideas out there and people ask you those hard questions. It also helps me feel even more confident. And so, I was pretty sure that this is all really true because I’ve used it with lots and lots of people. But of course, there are lots and lots more people out in the world I haven’t used it with. So every time I’m up against something, a difficult challenge around it. The way that it works, if it does, and it has so far, I’m like, oh this is even better than I thought. Nancy: Yes. Oh, isn’t that the best feeling in the world when that happens? Michelle: I know that happens with yours because I know. Of course, I read your book, and I know about these strategies. So, let’s talk about them so that everyone else gets in on what we’re both kind of vaguely referring to right now. Tell us about the Live Happier Approach and yeah just tell us about it. Nancy: Okay well, in the Happier Approach there are three personas, three characters that I came up with. We’ve met the monger who is the voice in our head that’s spreading propaganda. And then the second voice, a lot of times when we do inner critic work the message is have self-compassion. How to deal with your inner critic? Have self-compassion. And I struggled with that because I didn’t really know what that meant to have self-compassion. Because my whole life, my monger had just been running the show. And so, people talk about the inner mentor or the wise one as this voice that we’re supposed to be that counters the monger. And I could never find that voice. The voice I kept finding was the character I called the BFF. And the BFF is what I call false self-compassion. But this was for years my counter to the monger and that is the voice that’s saying, “Go ahead, have that third drink. Go ahead, eat the whole pint of ice cream. You deserve it. You had a really bad day. Go ahead, skip the work out. You’re sore, you don’t need it, who cares.” It’s that super laid-back voice. And I would go back and forth between the monger and the BFF. And the monger and the BFF. And I would be super uptight and full of anxiety with the monger. Then I would need to relieve the pressure of that and I’d go for the BFF, telling myself I was practicing self-care. I was just living in this frenzied state because I didn’t know what I really wanted. When I do presentations, that’s the piece where I see people’s eyes light up. I talk about the monger I get a few nods. Like yeah, yeah, yeah, they heard of this concept before. But the BFF is when they can really see monger because they have the foil to it. They can see counter and they can relate to that push and pull that those two voices put us in. Michelle: I want to ask a question about the BFF. So the monger, you feel crappy because the monger is saying all these crappy things to you. But what I’m taking away from this, and what I normally take away from it when I think about that concept from your book, is that the BFF also you end up feeling like crap, anyway. Like for a moment you get this release. You’re like oh good I can have the third glass of wine or the cupcake or whatever. But then you’re like, “Oh god now.” Then you beat yourself up. Michelle: I might be over-identifying with the BFF in this moment. Nancy: I might have done that when I pulled up the ones that I googled earlier today. Michelle: Good thing we’re having this conversation so you can be reminded that you also have a biggest fan. Nancy: And the big part of the book I talk about values and knowing your values. Because I think that’s when our biggest fan can step in and helping us recognize this is a value so we need to be pushing towards this. So the next phase is people were like I don’t think I have a biggest fan. I hear people say, I don’t think I have a biggest fan. So I came up with an acronym called ASK. And this is how you access the biggest fan. I say you ask to call in the biggest fan. And the first step in ASK is acknowledge what it is you’re feeling. And so that’s the A, acknowledge what you’re feeling. And the reason I had that in there, so let’s do the scenario of you’re standing in the wings getting ready to go on for a speaking gig. Michelle: Hurray perfect. I love it. Nancy: And so, your monger’s coming in, you’re going to mess this up. Who do you think you are? You don’t know this well enough. There’s so many experts out there. We can go on and on about that. So it’s simply to stand there and say I’m going to acknowledge what I’m feeling and I’m feeling scared. I’m feeling stressed. And it’s not to justify those feelings. It’s not to prove that they’re worthy or not worthy, it’s just to name them. Michelle: Because you’re located in your head anyway. It’s kind of like meet yourself where you are anyway. And just radical acceptance. Right now, you’re spinning around in your head. So let’s do a head game that will help you slow down. Nancy: Yeah. And so, acknowledging what I’m feeling would be like and I actually say to myself, “Oh Sweet Pea,” because that’s the voice of my biggest fan. So she has a little nickname that she calls me. Just kind of happened over time but it’s made a huge difference. I’ll say, “Oh Sweet Pea, you’re scared. You’re scared, that’s okay. It’s okay. We got this.” And then slow down and get into my body. And then kindly pull back to see the big picture as the K. So pull back to see the big picture and I threw in the kindly because we tend to be so hard on ourselves. And that’s to say, we’ve prepared for this. We have this down. You know this material, this is your rooftop message. You were brought here to share this. We know what we’re doing. We have our notes. Let’s go out there, find our people. Practice our posture and smiling. And here we go. And so, it’s just a way to get out … I mean I kind of act like I say the monger puts blinders on us like a horse don’t look forward. And by practicing ASK we can pull back those blinders and just see, “Oh wait all the people out in the audience are human too and they probably want what’s best for me too.” They want me to succeed. They’re cheering for me. They don’t want me to fail up there. So we can see that in a bigger way than when we’re just in the voice of the monger. Michelle: … characters. And they’re just such a great visual of each of these personas. And then the ASK process, the simplicity of it is so and really the immediate applicability. You can really be standing in the wings, about to speak just as you described and do all of that within just a matter of seconds. And totally change your state, which is so powerful. So you can then move forward in the way that your biggest fan is really inviting you to do. Right? Michelle: So do this thing. It’s okay, you can do it. Even feeling scared, you can, Sweet Pea. Michelle: Yeah. Thank you so much for so clearly articulating these concepts. And putting them out in the world. As I say to people often about speaking and thought leadership and just doing big things in the world overall. You can buy books about how to craft a talk. I wrote one, lots of people have written great ones. It is important to know best practices. I’m not going to lie. All of those things matter but you can learn those. That’s not what’s in the way. What’s in the way for most of us, and you and I both know this from years of doing the dance and you know, and I know it from working with lots of people who still are doing that dance, as am I.
Michelle: Right. You keep doing that dance. But when we have these tools that help us release the very human response to doing something vulnerable and scary, then we can keep moving forward on the things that we know we are called to do. That we’re meant to be doing in this world. Michelle: And when you’re called, you are and other people I’ve worked with our, like I am, to step into visibility. These things that feel particularly scary, it’s so powerful to have tools that can be used so immediately. They are amazing, thank you. Nancy: Aww, thank you. I love hearing that. Michelle: Yeah and it’s just really true. And I feel like this, well let’s say a longer interview than I usually do it’s really, it packs a double punch. You’re out there sharing this message and have been on a path to getting there. I so appreciate you showing me on this path to getting there. And to continuing to step into a bigger and brighter light out in the world. And then also these tools around speaking anxiety that it’s really one of the biggest things in the way. Whether we know it or not. I mean, many of my clients who are already in powerful positions, who are already out there doing things in the world. I had one client say to me recently, she’s like, “I didn’t actually … I would have told you I’m not … I don’t get anxious about speaking.” And it’s only in sort of diving deeper into that sort of nuances of what’s getting in my way that I realized that I have just learned how to turn away from the anxiety. And it is what’s been causing my procrastination. So yes, I’m out there speaking. Yes, I’m out there doing cool things in the world and people looking from the outside would say, “Wow she’s killing it out here.” But I always walk away, this is her talking to me, I always walk away going I know I could have done way better. I just didn’t have the time. Nancy: And I relate to that too. Michelle: Yeah, me too. So tools like the ones that you’re sharing and that you share in the is it the Happier Approach? Sorry, it’s the Happier Approach. Nancy: The Happier Approach. Oh yes. Live Happier is my website, The Happier Approach is the book. Michelle: So you can learn lots more and Nancy, also tell us the name of your podcast. Happiness Hacks? Nancy: It’s the Happiness Hacks. It comes out twice a month and it’s just short tidbits of information around this topic. Michelle: Awesome. And I know I talked about it in the intro but so many resources. Thank you for putting all of that out there into the world and for having this conversation with me and us today. I feel very lucky. Nancy: Thank you. This was awesome. Michelle: Okay, take care. Talk to you soon. I hope you enjoyed that conversation that I had with Nancy Jane Smith, even a fraction as much as I did. It’s just so true that this path to thought leadership, this ride can be so unexpected and windy, curvy. And really, having resources like she shares in her book and through that conversation. It’s a huge part of how we get out of our own way on that path. Speaking of resources, you know I love to give you as many as I can to help you get out there and share your message far and wide. So remember, you can go to michellebarryfranco.com/start, and get my Get Started Speaking Guide. Which is a really content-rich resource, totally free to you, that will help you get out there on that path. It is such an honor to be with you, as always. And I can’t wait to be with you next week. Take good care.